What the best-dressed tables in the Hamptons might be wearing this summer. A floral arrangement with such lush colors, so artfully arranged its like a vacation for the soul. 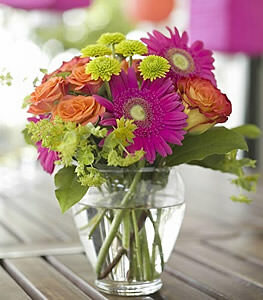 A clear glass vase, featuring a bouquet of hot pink gerberas, orange spray roses, orange roses and green button chrysanthemums, accented with oregonia. I am glad you take customer service seriously.